Got it! It seems to almost work. But the problem is with my coursesAll loader job SQL. 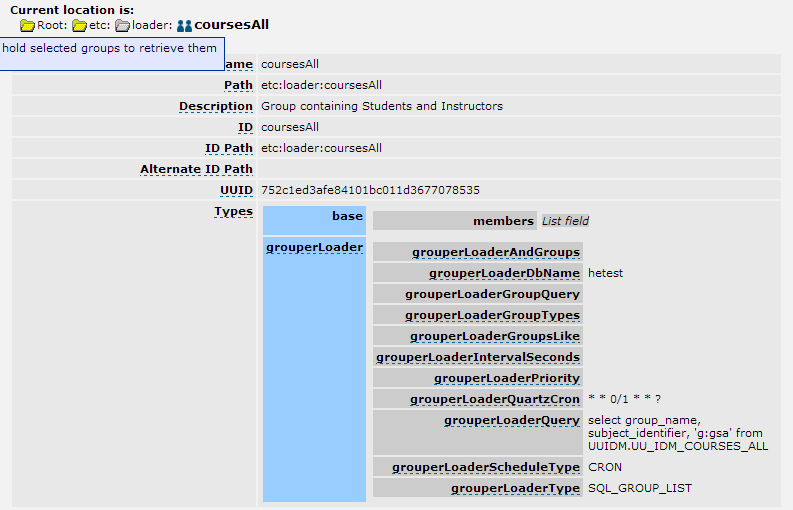 If I restrict the SQL to only return a given course number I can get my ‘all’ group to appear with ‘students’ and ‘instructors’ groups as members. Just what I want. But if I run the full SQL then it seems to find courses that my student or instructor SQL did not find. But does it does not find the courses the student or instructor SQL DID find. It is as if the different SQLs are complements of each other. Hmmm, having a little trouble. I think if all looks correct, but obviously something is wrong. Any ideas? Instead of have the SQL return all course sections and their students or instructors have the sql just return all the course sections and two rows as subjectID. These being “students” and “instruction” since we know that each section has groups by these names. These groups then become the members of the ‘all’ group. I also need to change the subject source in the Loader query to ‘GSA’ since that is where subjectID lives (ie the group students or instructors)? I think I am getting this right? I would not make a duplicate group that has all the members of students and instructors. I think you can do what dave is saying, though it should be a loader job, so it will change dynamically as the groups are added/deleted (with “like” string). So you can create a query against peoplesoft that returns group_name (the overall group), and subject_identifier (the group name of the member which is the students group or instructors group). So basically this will return twice the number of rows as courses that you have. If you have a dblink and can join to the grouper groups table and get the uuid of the group in a subject_id col that would be quicker, though it is not a requirement. Use GSH to create a :all group with the :students and :instructors groups as members? I’ve run into a mental block in designing my groups. I have created 2 Grouper Loader jobs using SQL_GROUP_LIST. One creates groups for each course section with students as members. The other creates groups for each course section with instructors as members. Both run SQL against our PeopleSoft SIS. I need a group for each course section that includes both instructors and students. I see 2 ways to accomplish this, one I know I can make work. The easiest thing to do would be create a third SQL_GROUP_LIST using SQL that returns both instructors and students in one query. But I was wondering if I might be better of creating Grouper Loader job that executes a query against the Grouper DB (GSA) the returns the members of the groups I created above. I didn’t see any way to leverage composite groups to achieve my goal. And I didn’t see a way to leverage include groups either. Any thoughts or opinions invited.